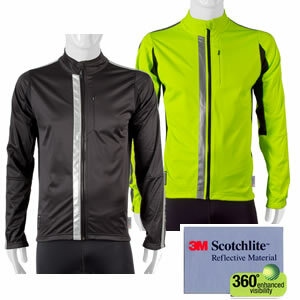 Jacket is ideal for the dedicated athlete who goes out before the sun comes up and after the sun goes down featuring 3M Scotchlite Reflective Material with 360 Visibility for an active outdoor lifestyle. 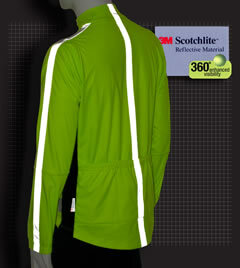 This Jacket has 360 degrees of reflective strength, for maximum luminosity and light reflection in low light conditions. The Jacket has a trendy, updated look that is flattering and comfortable. This jacket is engineered for fitness activity in outdoor winter conditions. 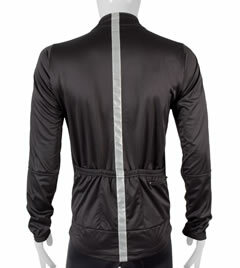 The jacket has a full zippered front with a zipper garage at the neckline. 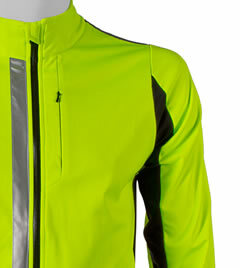 The stretchy side panels enable a fantastic fit for cycling. Two zippered pockets, one on the front with access for ear buds, and one on the back to secure valuables . Three easy reach back pockets that are deep and roomy for extra items like snacks, water bottles and extras. 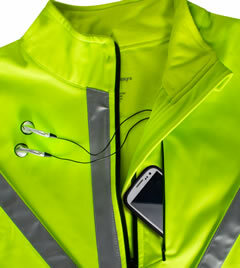 * Get increased visibility and safety during early morning and late evening outdoor activities. * Get optimal breath ability for thermal regulation of the body's temperature. * Water-resistant - Surface is hydrophobic to stay dry by allowing perspiration to evaporate. 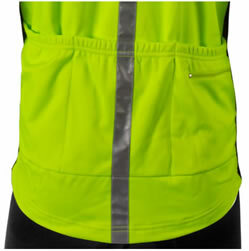 * Wind-resistant - Barrier reduces wind to keep you warm yet not clammy because it is breathable. 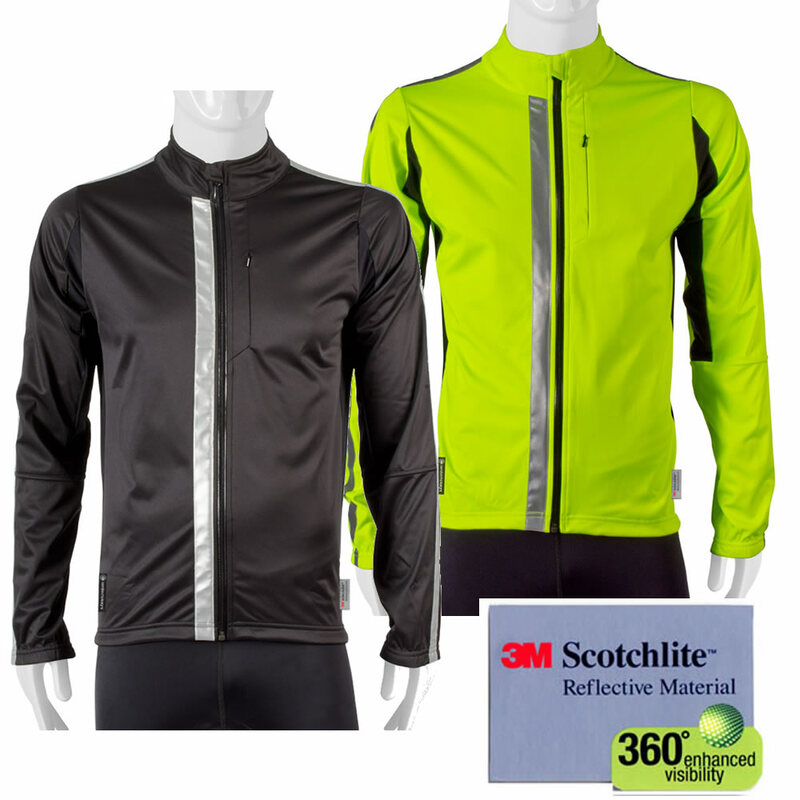 * Breathable - Wicking Polyester fibers pull perspiration into the surface for evaporation. Dries quickly. * Durable - Fabric is rugged yet delivers soft feeling comfort and warmth. 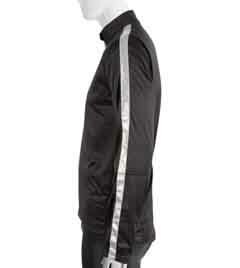 Three Back Pockets are deep and easy to reach with an added feature of a zippered Safety pocket. Any questions about this product? Ask Us! 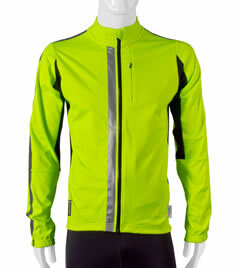 Perfect Cold Weather Cycling Jacket! 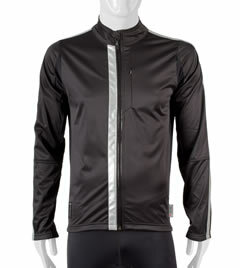 Aero Tech Designs has hit the mark with this cold weather jacket! 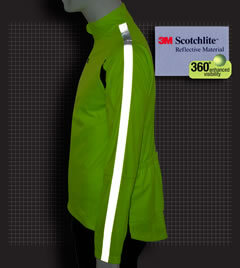 The highly visibility color and reflective material allows motorist to see you clearly from any direction! The jacket has great functionality due to the multiple back pockets. There are also zipper pockets on the front and rear to keep valuable items like keys, credit cards, wallet's and even phones secure. The wind breaking capability is astounding! The jacket keeps your torso warm even in 40 degree F temps particularly when you have the appropriate base layer under the jacket. The fit is snug to the body but not tight which is ideal for me (52 inch chest = 3XL). I highly recommend this jacket for 40 - 60 degree Fahrenheit weather! 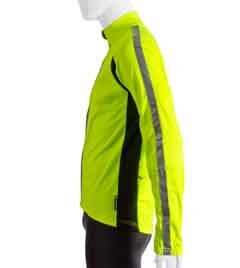 Outstanding product; warm enough to wear over several layers and ride in 25Âº. Cuts wind effectively, and certainly is visible...bottom could be a bit more generous and longer. So far I've used this on my morning commute at about 25F, and it did okay. I would expect 20F is going to be the low spot, but I love how bright and visible this jacket is. The sizing runs a tad small. So for now i would call this my 20F-45F dry weather jacket. The winter is just getting started here. Great product and great service!! Warm, high degree of visibility. This product was ordered one size larger than my customary size... I have found that in general cycling products seem to be slim fitted..which is too confining for me. I am happy with this product And I am especially happy with the variety of products and customer service and support from Aero Designs!! I will definitely order from them again and I recommend them highly!! The jacket works well as a primary wind stopper. I can wear a base layer and thin jersey and be fine down to 25f. The waist is more loose than you'd expect. The jacket was much warmer than I thought it was going to be, fit great, visibility was good! I am happy with the fit and feel. I am a beefier rider so the 2x was good for me. I bought mine a year ago and have been waiting ever since to use it ( too much snow among other things last winter). I was surprised when I ordered that a 40 is XL. But I am a perfect off the rack 40 and always order 40-42 sizes. On this jacket the shoulders and chest are about right, maybe a little larger than 40. But the waste is ridiculously large. I would have expected a 32-34 waste with a 40 chest. It is more like 42-44. Much too big. This is also quite a warm jacket for cycling. I has not realized it was fleece lined when I ordered. But I figured wear one less layer. My first ride the day started at 38 and it was about 45 at the end. It was cool at 38, because if the loose waste, but at 45 I sweating. I will ride down into the 20s, so I expect it will be good for real cold, but I need a jacket when it drops below 50 and this will not do until it hits 40. I was looking for a high viz. jacket to wear in the fall. Warmth and fit are great. Several issues however. The phone pocket is too small for an iPhone 6 Plus or a galaxy product. The zipper is opposite for us American males. The cuffs are elastic and not adjustable. I'm 6'2"+ 310lbs and the 4X is a bit snug and wish there was a 5 X, but more incentive to keep losing weight. If you're in my size range, this should help in your decision. That said, wore it on a few winter rides with 1 or 2 layers under and it kept me warm... even in 8-degrees in January in Michigan. Also had a slip on ice and the jacket helped cushion my fall and didn't have a scratch on it... wish I could say the same for my shoulder 6-months later. 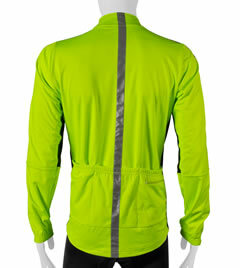 Jacket is extremely well-constructed, but could have better breathability. Exactly what I expected. Bright visible warm at 40f. Like other reviewers have mentioned, the construction of this jacket is breathable while keeping you warm and wicking moisture away. No complaints, it's a great jacket and fits perfectly. Which by the way, I have a bone to pick with some of the reviewers complaining that the jacket is sized smaller than it should be, and that you should get the next size up in order for it to fit properly. I did just that and had to return the jacket because although it did "fit" in the larger size, it also felt boxy. If you read the description for the product, it's been made with "the dedicated athlete" in mind, i.e. somebody who's in shape. It has a fitted cut to it without feeling constricting as it stretches out. The XXL size is fine for 6'4" 190 pound me. I have been a serious cyclist for 40 years ridding year round in both Ohio and Idaho. The breathability surprised me. When I initially opened the package I thought it would be a sweat box. Not so. The small pocket in front for the cell phn. is a nice touch. The zipper pull is pretty neat ! !